Install Mexican and Terracotta tile in your home to create a beautiful floor that compliments any type flooring as well as most types of decor and color wall paint. How we clean your Mexican and Terracotta tile to restore the original finish and then seal your floor and grout to protect it from stains, and and frequent from traffic. We can match you tile’s color with a professional repair job or replace the damaged or broken tile with new replacement. Read more about repairs. Our South Florida Trusted Pros for Mexican Tile Services. Many Mexican tile floors that need refinishing are in basically good condition, but may require a heavy duty cleaning to remove surface dirt that has bonded to the existing sealer. It is important to remove this dirt before the tile is sealed, otherwise the dirt will be sealed into the floor. Over time, this dirt will build up and the only way to remove it is to chemically strip the floor. Our cleaning process involves applying our heavy duty cleaning solution, then scrubbing the floors with nylon hand scrubbers. Our mexican tile cleaning solution breaks down the top layer of sealer, allowing us to scrub the ground in dirt, scuff marks, and scratches from the tile. This process is done by hand. Most terracotta tiles are relatively soft, so floor machines may actually wear through the surface of the tiles, grooving the clay. Many times floor machines use too much water. 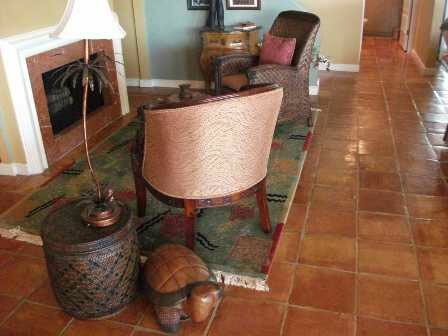 This water can be absorbed into the porous terracotta tiles, which leads to efflervesence as the floor dries. Floor machines also may miss the low spots of the floor while wearing through and grooving the high spots. By chemically cleaning a floor by hand, each tile can be scrubbed according to what it needs. After a floor is completely cleaned, we properly seal the floor. This is an important process as it will protect the floor while enhancing the clays natural colors. The amount of sealer applied depends on the level of shine desired and the type of sealer used. We generally apply 3-5 coats. This is usually enough to keep your floor looking beautiful for years to come. From moving furniture, cleaning and sealing the floor, to replacing the furniture, most jobs can be completed in one to two days. 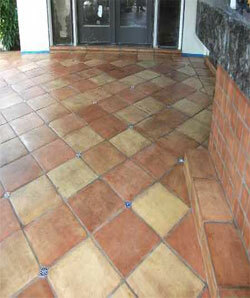 We also do talavera tile cleaning and saltillo tile cleaning. We are top rated in SoFlo. Boynton Beach, Florida 33426 on Congress Ave.